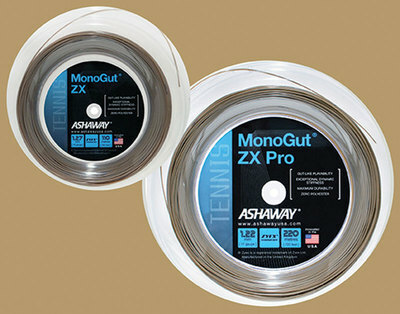 Ashaway, RI — Ashaway Racket Strings has made its popular MonoGut® ZX brand tennis strings — 16L gauge (1.27 mm) MonoGut ZX, and 17 gauge (1.22 mm) MonoGut ZX Pro — available in bulk reels for more efficient hybrid stringing. Of the two, MonoGut ZX Pro is a thinner lighter string, designed to provide even better elongation, snap-back and playability for players who do not require the added durability of the 16L gauge MonoGut ZX string. Both are of 100% Zyex monofilament construction, which provides exceptional dynamic stiffness and gut-like playability. The total lack of polyester increases elongation and decreases stiffness for comfortable soft power. Ashaway Racket Strings are made by Ashaway Line & Twine Mfg. Co., the only U.S. manufacturer of string for squash, tennis, racquetball, and badminton. Operated by the Crandall family since 1824, Ashaway has been making racquet strings since 1949, and is responsible for several important technical innovations. Ashaway has been the Official String of USA Racquetball for more than ten years, and has recently been named the Official String of Professional Tennis Registry and the Women’s Squash Association. Ashaway Line & Twine Mfg. Co. also makes braided products for medical and industrial applications. For more information visit ashawayusa.com. Zyex is a registered trademark of Zyex Ltd.